Input text: A shiny dark grey 7 foot tall satellite dish is facing southeast. 5 foot wide and 2 foot deep space station is 3 foot right of satellite dish. Space station is 4 foot tall. Space station is facing up. Space station is petrol blue. 3 foot tall and 3.5 foot wide clear turquoise cone is 2 feet in space station. cone's bottom is clear cyan. Cone is upside down. Huge cyan light is 1 foot in cone. Big delft blue light is 3 foot above cone. huge blue light is 4 foot above cone. huge clear head is 5 inch in cone. 1.7 foot tall shiny petrol blue brain is -18 inch in front of head and 5.3 feet above ground. 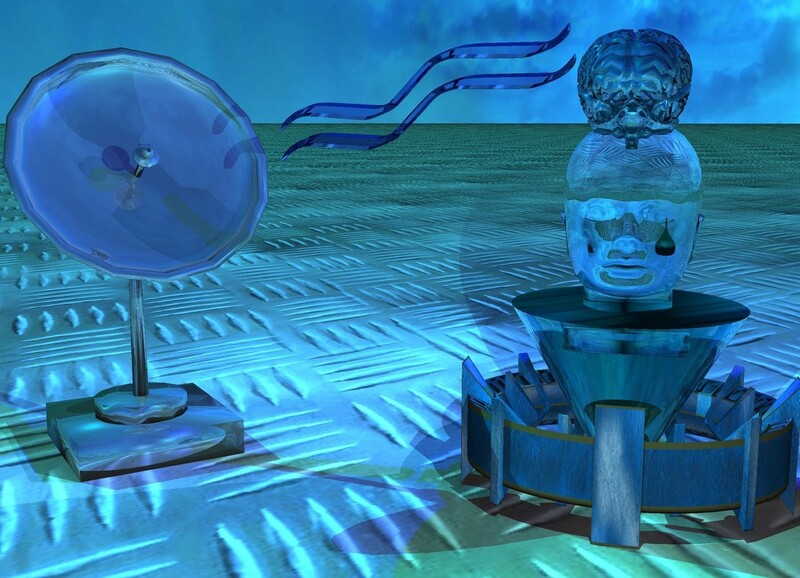 turquoise light is 1 foot in front of brain. shiny dark blue aquarius is -0.3 foot right of satellite dish and 4.8 feet above ground. aquarius leans 20 degrees to right. aquarius is 5 feet long and 1 foot tall. small cyan syringe is 1 inch in front of head and -0.7 foot to right. syringe is 4 feet above ground. ground is 25 foot wide [texture]. camera light is baby blue. sun is cyan.